June is National Acne Awareness Month. Often dismissed as a condition of adolescence, acne is much more than that. It is a medical condition that most often can be addressed with the correct treatments and medications. According to the American Academy of Dermatology (AAD), acne is the most common skin disorder in the U.S, and it affects 40–50 million Americans at any one time. Hormonal changes:Acne can flare up easily in teens and adults—especially women during pregnancy, menstrual periods and menopause. Heredity:Genetics may play a role in whether you have or will have acne. If one or both of your parents, a sibling, or your child has acne, its cause could be genetic. One study found that this was the case for 50% of adults with acne. Comedogenic products:Skin-clogging products are not your friend. Makeup, body lotions and even hair care products, can clog your pores, leading to breakouts. Stress:Yes, stress! 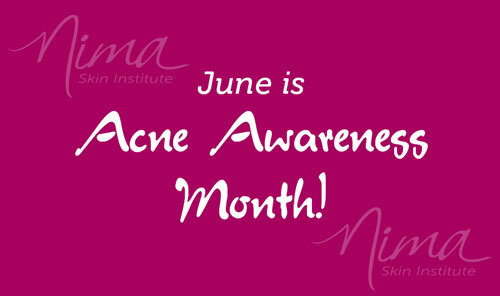 Although it won’t cause acne, it can aggravate your hormones that do. The higher your stress level, the greater the occurrence of acne. Triggers can vary from one person to the next. I recommend tracking what seems to cause your outbreaks. Whiteheads—stay just under the surface of the skin and have a white surface. Blackheads—small lesions that look like an open pore that is black in color. Papules—small pink bumps that can be tender. Pustules—red at the bottom and have a white colored fluid on top. Nodules/Cysts—large, painful, solid pimples that are deep in the skin. Talk with us about what you can do to help avoid acne and minimize flare ups. Our goal is to help you have and keep your skin looking its best. Please feel free to contact us to make an appointment.